In this section, having previously created a module, we are going to add a t-test analysis to it. 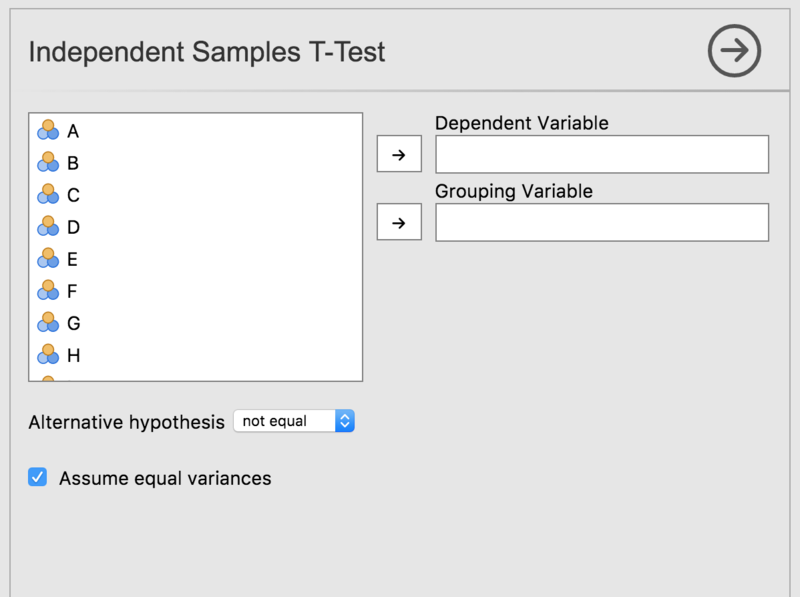 An independent samples t-test is typically used to determine whether two groups differ on some variable. For example, you may be interested in whether children from one neighbourhood are a different height than children from another neighbourhood. In this case, a data set would have one row for each child - one column would contain their heights, the other column would contain which neighbourhood they are from. 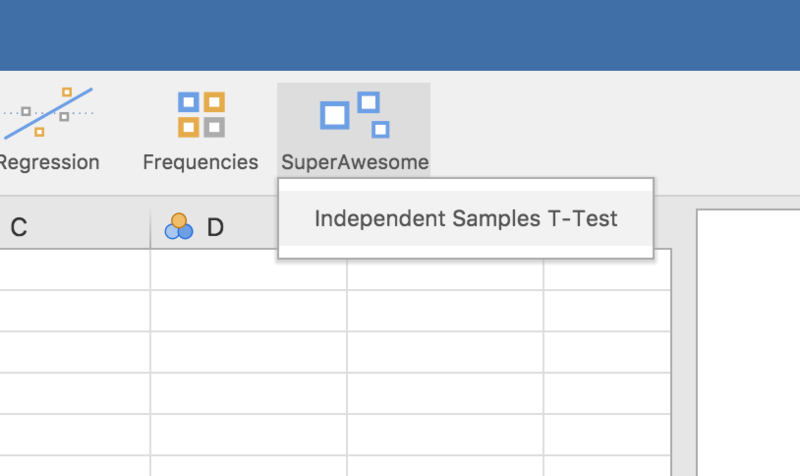 In this next section, we are going to create a t-test jamovi analysis which makes use of this function. At this point I’m a little embarrassed to say that there are 5 files per analysis. This structure does make things a lot more manageable, so although it may seem excessive at first, there’s a good rationale behind it. Just bear with me, it’s not as overwhelming as it seems. ttest.h.R The header file is automatically generated from the .a.yaml and .r.yaml files above, and makes writing your analysis a lot easier. You don’t ever need to look at this file, and you certainly shouldn’t edit it. ttest.b.R The analysis implementation is where you’ll write your analysis, and where you’ll spend most of your time when developing jamovi analyses. As we’ll see, this is an empty template waiting for an implementation. First up, we’ll look at the analysis definition in the ttest.a.yaml file. yaml is a simple, easy to read text format for structured data. If you’re new to yaml, you can read more about the format here, but that probably won’t be necessary. It’s intuitive and readable, and you’ll probably have no trouble picking it up. The name is a unique identifier for the analysis, but it also corresponds to the name of the R function which will be made available from the package. As such, the usual constraints on function names apply: it must begin with a letter, and can only be made up of letters and numbers (jamovi disallows analysis names with dots in them). The title of the analysis is how the analysis appears in menus, help text, and in the results. Next is the jas or ‘jamovi analysis spec’; you should just leave this at ‘1.1’. Next, we have the analysis version. Each analysis is versioned in jamovi, and you should make use of semantic versioning (but let’s not worry about that for now). The SuperAwesome menu will now be available, and will contain Independent Samples T-Test. We see they are of type Variable. This means they require the user to provide a column from the data set. As can be seen in the UI, they are represented as ‘drop targets’, where columns from the data set can be assigned through drag and drop. alt is of type list, which has been turned into a drop down list, allowing the user to choose between the options. We see that options of type Bool are represented as checkboxes. There are a number of different option types. A more comprehensive description of each of them, and their properties is available in the API. Of course, our analysis doesn’t actually do anything yet – we haven’t written any R code.